Roller blinds are elegant window coverings that have been known to work with almost all decor types. As such roller blinds are extensively used and are preferred by many people for their durability, ease of use and flexibility. As part of their care, roller blinds needs to be cleaned every once in a while to get rid of all physical dirt and dust that may settle on them. If you have some roller blinds in your home, then you must be aware that you have to be careful when cleaning the blind to ensure that you do not compromise their quality during the cleaning process. To be on the safe side you need to read the manufacturer’s instructions carefully even before you can think about cleaning your blinds. Below are six roller blinds cleaning tips that you can follow to make cleaning your roller blinds much easier and ensure that your roller blinds stay in mint condition and serve you well for a longer duration. This is a simple tip that will help in getting rid of most of the dirt on the surface of the blind. For those stubborn dirt particles, use the brush attached vacuum to dislodge the dirt and then go ahead with your vacuuming. You can vacuum your blinds frequently to prevent dirt build-up and eliminate the need for frequent deep cleaning. 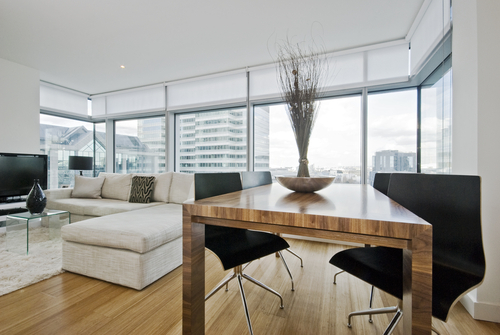 A thorough roller blinds cleaning is recommended whenever your blinds get excessively dirty. If you notice that your blinds are looking dull with visible dirt and stains on them, then it is time to give them a through clean. In order to clean them, you need to remove them from the rollers not just to make your work easier but also to ensure that you give every corner of the blind enough attention and get rid of all accumulated dirt and dust. A solution of warm water and soap will work magic on your dull blinds. Off course this does not apply to all blinds as some should never come into contact with water. In the case of such blinds soaking them in water will only ruin them. These blinds should simply blotch with a damp piece of cloth to get rid of any obvious stains. You can also scrub off some dirt using corn flour and use some towel or some soft cloth to get remove the flour particles once you are done cleaning. For blinds that can be cleaned with water, fill half your tab with warm water. Warm water is recommended as it helps in loosening the dirt without affecting the blinds. Hot water on the other hand will either lead to shrinkage or melt any glue that has been used to join the blinds. Hot water should therefore be avoided at all costs. After soaking the blinds, use some soft cloth to get rid of any dirt on the surface of the blind. The dirt will have loosened by now and all you have to do is to gently rub on the surface and the dirt will come off. If you have any stubborn stains on your blinds, use an old toothbrush and gently scrub the stained area. A little scrubbing with the help of the warm water and some mild detergent will work for most stains. Resist the urge to vigorously scrub the blind in a bid to remove stains as this will only ruin your blinds. Some little bleach helps in brightening your blinds. For white blinds, use the normal bleach to get rid of any tint and stubborn stains. For coloured blinds, you can use some colour-safe bleach that will be effective in brightening them without compromising their quality in any way. After cleaning your blinds in a solution of warm water and some detergent, you need to rinse the blinds properly and get rid of all soap residues. This is particularly important because any soap residue left on the blinds will only act as a dirt magnet and you will be forced to clean the blinds more often. This will wear your blinds much faster not to mention the fact that this can be tiring and time consuming. To adequately rinse your blinds, simply drain the water you had used to soak and clean the blinds and fill your tub with some clean water. You can repeat this procedure until there is no soap left on the blinds and the rinsing water is clear. These tips have been proven to work where roller blinds cleaning is concerned. Make use of the ones that work for you and enjoy getting all the dirt and grime off your blinds. You can also get a reliable cleaning company to do the work on your behalf and bring that brand new look on your blinds back.